This prediction, of course, is all reliant on Cleveland never again playing like it did Sunday night. The lazy effort, the lack of motivation, the assumption Boston was just going to wilt after two straight blowouts, it all had a hand in the Cavs’ loss. Letting the Celtics back into a series which appeared to be already over is essentially playing with fire. If the Cavs do it again, they risk getting burned. To be fair, it’s understandable to see why Cleveland shifted into cruise control. Having just beaten Boston in Game 2 by what felt like infinity, everyone seemed convinced the series was over. As soon as word broke Celtics star Isaiah Thomas was out for the rest of the year, you partially expected the team to forfeit. Cleveland, having yet to lose in the postseason and hosting the next two games, undoubtedly bought into the idea Boston was just on borrowed time. Of course, to think that way is one thing. To play as if the series is over before it is leads to a different result, as we all saw Sunday. Though the Cavs built out a significant third quarter lead, you never felt as though they were about to blow the doors off the Celtics. The team in general appeared to be aiming to exert as little energy as possible. Most notably, LeBron James put forth a perplexing and disengaged effort, tallying just eleven points after averaging 36 PPG in the previous series and looking all-world in Games 1 and 2. As a result, Boston chipped its way into the deficit and, before you knew it, Avery Bradley‘s game-winner bounced its way through the rim and sent a Cleveland crowd home in stunned disbelief. I have no intention of scouring for a deeper meaning behind the Cavs’ performance in Game 3. With a 10-1 record so far this postseason, you have every reason to think this was just a night where Cleveland fell guilty of over-confidence. Sure, James’ stat-line and confusing indifference brought back horrid flashbacks of the infamous 2010 Eastern Conference semis. However, at the moment this game can be chalked up to the Cavs being caught off guard by Boston’s still-remaining effort. With all of that said, Cleveland need not have another night like Game 3. 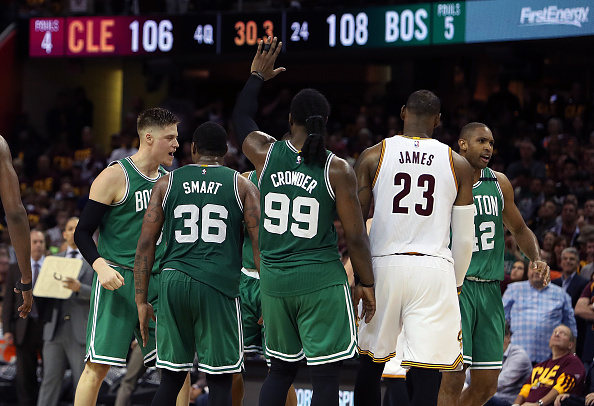 If there’s an assumption that the Celtics’ just gave their last real shot and will now slowly fade away, if the Cavs think they’ll blow out the competition just by showing up again, things could get more dramatic than need be. Consider Boston’s frame of mind after last night. The players just beat the defending champs. They did so after being down 21 in the second half. They did so without their best player, and they did so in enemy territory. After a night like that, you better believe the Celtics are taking the floor in Game 4 with a renewed sense of confidence. You’d like to think the Cavs know this, that they meant every word when saying they needed a slice of humble pie. You’d also more than expect James to throw his confusing Game 3 performance in the trash and get back to the dominance we’ve seen so far in these playoffs. If Cleveland does get back to playing motivated basketball, it won’t matter how energized the Celtics are in Game 4. The series will return to business as usual, and the Cavs can begin planning for the Finals with a little less vacation time than we originally expected. Another night like Game 3, though, and it gets a little dicey. If Boston were to somehow take two vicious shots to the jaw, get back up and steal two games on Cleveland’s court, suddenly it has home court advantage back. The early series blowouts will be a thing of the past, and suddenly the Cavs have to start waking back up. Again, at this point I’d be surprised if things got this far. Vegas odds still overwhelmingly favor the idea Game 3 was merely a bump in the road for Cleveland. As I said coming into this series, the only thing which could keep the Cavs from the Finals is the Cavs themselves. Sunday night was a great example of this. Hopefully it was the one and only example the team needs as proof.